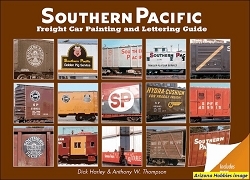 Southern Pacific Western Division is an all-color pictorial covering the operations of the Southern Pacific Railroad in northern and central California, from Sacramento to the San Francisco Bay Area and beyond, north to Eureka and south to San Luis Obispo. Seven chapters present stunning color photography of the diverse geography of this part of the Golden State, from redwood forests to open farmland to scenic bay side and ocean vistas to busy urban centers. 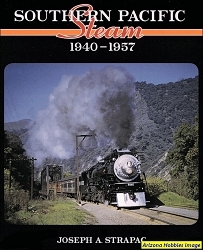 While emphasis is on operations in the 1960 through 1990 time frame, Southern Pacific Western Division includes many historic photos from the 1940s and '50s as well, some of which have not previously been published. It's all here: The multitude of fabulous paint schemes that SP used in the steam-diesel transition era, including Daylight, Black Widow, Tiger Stripes, and Scarlet and Gray, plus several experimental and special patriotic paint schemes. 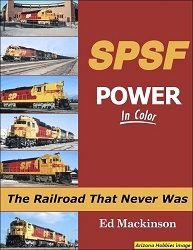 SP's diverse steam motive power is presented, with Consolidations, Mountains, GS-Class and of course the big Cab Ahead Articulated Consolidations featured. Diesels from EMD, GE, Alco, Fairbanks Morse, and the German builder Krauss-Maffei are shown in a variety of first, second, and third generation cab and hood configurations. 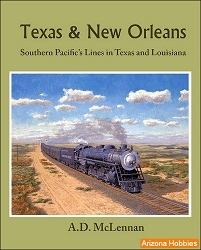 White River Productions, hardcover with jacket, Color photography.